Florida State Record: 130 lbs. 1 oz. 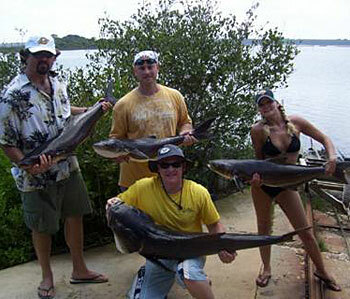 Cobia are a pelagic fish which we target on nearshore or offshore charters. Like many open water fish, they are attracted to floating objects like navigation markers, wrecks and also artificial reefs. They typically feed on shrimp, squid, crabs and other fish. During the spring we fish for cobia by finding large manta rays just outside the breaker line. Cobia follow these rays in search of food.